Introduction to Business covers the scope and sequence of most introductory business courses. The book provides detailed explanations in the context of core themes such as customer satisfaction, ethics, entrepreneurship, global business, and managing change. 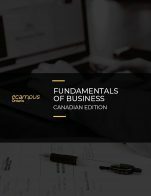 Introduction to Business includes hundreds of current business examples from a range of industries and geographic locations, which feature a variety of individuals. The outcome is a balanced approach to the theory and application of business concepts, with attention to the knowledge and skills necessary for student success in this course and beyond. Introduction to Business cover is copyrighted by Rice University. It is not subject to the Creative Commons license and may not be reproduced without the prior and express written consent of Rice University. 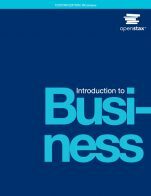 Introduction to Business (OpenStax) by Lawrence J. Gitman, Carl McDaniel, Amit Shah, Monique Reece, Linda Koffel, Bethann Talsma, James C. Hyatt is licensed under a Creative Commons Attribution 4.0 International License, except where otherwise noted. •	The chapters are very thorough and provide a great introduction over a big picture for managing and operating a business. Materials are very updated too. And each chapter has been written to cover the pretty broad overview of the key topics in each business subject area. •	Page 662 – goal-setting should also cover S.M.A.R.T goal setting approach. This topic covered in this textbook is very vague. •	Ethics activity and critical thinking case at the end of each chapter provide opportunities for very useful and meaningful classroom discussion. •	I enjoy the Q&A style in each chapter to review the key areas within the main topic areas. •	Ethic activity and critical thinking case at the end of each chapter can easily offer excellent materials for classroom discussions and/or assignments. Overall contents, including the diagrams and other supplementary material, are generally accurate. But some areas are showing minor errors and biased. Since this is a textbook based heavily on the US context, I can see some biases to favour US. When I read from the non-US perspective, I would have some concerns over certain chapters. •	“With enough intelligence and determination, people can get rich almost anywhere in the United States.” – This is a misleading statement. I do think that it requires more than just enough intelligence and determination to get rich. Also, what is the definition of "getting rich"? Different individuals have different intrepretations. •	Compressed workweek and 4-day workweek should be the same, but the text implies that they are different on page 352. •	Exhibit 14.1 – first line under “Current Assets” with number is not correct. This should be the heading for the category. Chapter 17 - This is a great topic area, but I am quite disappointed about the contents covered. This chapter should focus more about various career paths that a business degree can lead to. •	Page 655 – This phrase, “You Are a Winner Because You Elected to Go to College!,” is very biased. College education will be helpful in developing students, but it does not guarantee future successes. There are other factors! •	Page 655 – “Earn more money. People who go to college usually earn more than those who do not. Currently, a bachelor’s degree is worth a minimum of $20,000 a year more than a high school diploma. If your career spans 45 years, you could earn close to $1 million more than a high school graduate.” - I don't see any reference to support these figures. •	Page 664 – “It is indeed a rare privilege because far less than 1 percent of traditional college-age people around the world get to attend college.” - No references about these numbers. Is it based on a research or just a hypothetical numbers? •	Page 657 – “If you work 40 hours a week for the next 45 years (less vacations), you will put in about 90,000 hours on the job.” – This is a minor bias. Most people in business do not work only 40 hours a week. It is unnecessary to use a specific number to deliver the same meaning. •	Page 665 – “learn to concentrate” topic is pretty biased as each student learns and studies differently. I think this part should be left out. Overall, the textbook is very updated except a few minor outdated information. I really like to see the discussion about new trend for each topic area. This can provide a pretty fresh perspective to student to think beyond the current situation. In addition, links for various websites related to the chapter are very helpful resources. •	For external business environment, it would be easier to use the PESTEL model to illustrate the concepts. Then the following topics, e.g. economic systems, macro- and micro-economics can be incorporated under the PESTEL. •	Very thorough coverage on economic systems. Table 1.1 is very useful. Exhibit 1.6 is good but it looks pretty busy and a bit confusing. •	Section 1.8 seems to be pretty odd in this chapter. It can be allocated to later chapters, e.g. human resources management and international business management. •	Ben & Jerry’s Ice Cream example is one of the few extreme examples. It may not be a good one. •	Good to include a few links to illustrate code of ethics from large corporations. •	Stakeholders are discussed pretty briefly under CSR topic, but good to see coverage on latest trends. •	Pretty comprehensive coverage on business ethics. •	Begin with Canadian context (Domino Pizza), but overall the text is still written from the U.S. perspective. •	Good to mention impact of terrorism, but it is a bit odd to begin the chapter with this topic. Other topics, like import/export, balance of trades and currencies, etc are great. •	Fear of trade and the benefits of globalizations are good discussions. •	Good coverage over trade barriers too, especially with arguments for and against Tariffs. •	Latest trade conflicts in 2018 should be updated to reflect more recent changes to the global trade environment. •	Pretty thorough coverage over entry strategies. •	Section 3.7 should be included in the trade barriers discussion. •	“Ethics in practice” may be better included in Chapter 2 about CSR instead. •	Good coverage over advantages and disadvantages for sole proprietorships. •	Good explanations over different types of partnerships. “Perfect partners” can be a good classroom participatory activity. •	Corporation – incorporating process can be excluded. This is pretty U.S. focused, and can vary in different countries. It is better to make the discussion based on more general discussions. Exhibit 4.4 is a very clear illustration of the corporate structure. •	Table 4.4 provides a great summary of the three types of business organization. •	Cooperatives – pretty good coverage on 2 types of cooperative. •	Good coverage on franchise, but I am not sure if this is the right chapter to include this topic? Won’t it be better to include in the next chapter about entrepreneurship? •	Good to begin with an entrepreneur story, and provide a reality check (“Are you ready to be an entrepreneur”). •	The distinctions between entrepreneur and SB owner may be confusing to students. It may be better to be excluded. •	Entrepreneur personality is an interesting topic. •	Section 5.3, "Small Business: Driving America's Growth" may be better to be placed at the beginning of the chapter. •	“Why stay small” is another interesting topic. Unfortunately, SBA is purely related to U.S. context. •	Detailed discussions over 4 management functions. •	Exhibit 6.3 is a great illustration to show different level of management. •	Table 6.5 is an excellent summary for manager’s role. •	It is great to see an interesting discussion over crisis management with different examples (shown in table 6.6). •	The multinational management may be better to be included in chapter 3 or left out rather than touching very briefly at the very end. •	Good introduction of the organizing function by mentioning specialization, departmentalization and delegation. These are the key concepts for this management function. •	Exhibit 7.5 is an effective illustration to show 5 types of departmentalization. •	Line-and-staff organization discussion is very simple and clear. •	Pretty good coverage over matrix organization. •	Also, good coverage over concepts like chain of command, span of control, degree of centralization and informal organization. •	Overall the topics covered are pretty comprehensive. •	Compensation – Social Security in US context does not fit the Canadian context. Also 401k is unavailable in Canada. Our retirement saving plans are structured very differently. •	Legal environment is based on US only. •	Pretty comprehensive coverage over various motivational theories. It is very straight forward to focus on these motivational theories in this chapter and cover in greater details. •	“What are the basic principles of Frederick Taylor’s concept of scientific management?” should be placed under heading, “Frederick Taylor’s Scientific Management”. The first 3 paragraphs in section 9.1 basically form the introduction of the outline of this chapter. •	Generally pretty precise explanations over each theory. It is pretty easy to understand and follow. Sufficient details are given at the introductory level. •	Theory Z may be confusing to students at the introductory level, and may be excluded from textbook. •	An example to illustrate expectancy theory will be helpful. •	Recognition and empowerment topics can be expanded a bit. •	Economic Incentives – sub-headings can be used to clearly outline different types of monetary incentives. •	Great introduction paragraphs to outline the operation management focus on both manufacturers and service companies. •	“The goal of customer satisfaction is an important part of effective production and operations” – this outward focus provides a different perspective to understand operation management, and this is lacking in textbook we are currently using. •	Exhibit 10.5 highlights clear differences among 3 production types. •	Great example for service company - “For example, a hospital converts the knowledge and skills of its medical personnel, along with equipment and supplies from a variety of sources, into health care services for patients” plus table 10.1 too. •	Pretty comprehensive coverage about factors to determine the location of operation. •	May need a bit more explanation over process layout. •	“Pulling it together” section has many great discussions about how to apply the concepts. •	“E-Procurement, Electronic Data Interchange, and Blockchain” – this topics are interesting, but actually pretty technical. The coverage is pretty brief in the textbook. I would suggest to exclude them at this introductory level. •	PERT – it is better to show a sample PERT chart while charts are shown for both Gantt Chart and CPM already. •	Section 10.7 covers an interesting area about the impact of technology over operations. This is in face an important topic. This can offer students contemporary perspectives. •	Overall, the contents in this chapter are very clearly presented, and the authors can make these complex and technical knowledge become so easy to understand. •	Very thorough definition of marketing is used at the introduction paragraph under section 11.1. •	It is great to see an emphasis on customer satisfaction. •	The strategies related to 5Ps (4Ps used in this section) can be included in the later sections of this chapter and the next one. •	I like the thorough coverage about the buyer’s behavior, and this relates well with the focus on customers mentioned earlier in the textbook and also this chapter. •	Exhibit 11.5 illustrates the tangible and intangible aspects of a product very well. •	Very clear and detailed discussions over various pricing strategies. •	Exhibit 12.2 is a good illustration of typical supply chain. It will be better to use a more modern example rather than CDs. Students may not be able to relate well nowadays. •	Exhibit 12.3 is another good illustration to show different distribution channels. •	“Functions of distribution channels” is a great topic. •	“The goal of supply-chain management is to create a satisfied customer by coordinating all of the activities of the supply-chain members into a seamless process” – good discussion to cover how supply-chain management can help marketing. This ties in well with the customers focus mentioned in the overall textbook. •	This area is not currently in the textbook we are using for our course, but I agree that this is an interesting and relevant area for students. 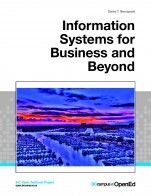 •	Many good introductions of basic terms related to MIS with simple examples to use them, like LAN, WAN, VPN and intranets, etc. •	It is good to see coverage about security concern for business, and the main reason to use VPN. •	Protecting data security is an important aspect of business, and this topic can raise students’ awareness before they really go to a real work environment. Many students may not take this concept seriously at school currently. Examples of computer crimes offer great reminders. •	Overall, this is a relatively shorter chapter. The author can make this technical topic easier to be understood. •	“Why are financial reports and accounting information important, and who uses them?” – very strong topics to kick off this chapter. •	Exhibit 14.4 is a excellent illustration to walk through how to calculate each key ratio based on the previous financial statements. •	“Attracting and Retaining Millennial CPAs” is an interesting group discussion topic. 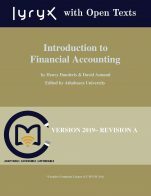 •	Overall, this is not too technical at the introductory level and this chapter can help students to understand that accounting is definitely more than just numbers. •	The basic characteristics and functions of money discussion is good. •	The rest of the chapter focus mainly on the US financial system. The general banking system is similar to the Canadian system, but not exactly. •	I am really happy to see a coverage over the 2007-2009 financial crisis. I always talked about this in my class, but it is not covered in our current textbook at all. •	Role of financial managers and short-term/long-term financing topics are general enough to be adopted even outside U.S. context. •	Pretty detailed coverage over the US securities markets and different types of securities, like stocks, bonds, and mutual funds. •	Good to see some discussion over securities regulations as well. •	Page 675-676 – Any possibility to include materials under Canadian context? •	Good to see various self-test exercises to help students to understand themselves better. •	It will make this chapter better if a few brief biographies from famous successful business persons can be mentioned. Their stories can be pretty inspirational to students. Overall, the textbook is very well written. Topics, like operation management and information management, are written with very easy-to-understand language. Most of the jargon/technical terms included are explained clearly and illustrated with good examples. 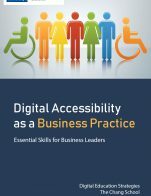 I found that the authors can make these complex and technical knowledge become so easy to understand and they can illustrate with good examples most of the time. The key terms section at the end of each chapter is great tool to help students to review the terms mentioned in the chapter. For more details and examples, please refer to my answers in the previous questions. Yes, the text is structured very consistently over each chapter. I really enjoy the layout - learning outcomes, small case to kick off the chapter, small introduction, then Q&A format to cover the entire chapter materials including good use of diagrams and tables, concept check section to help students to reflect what they just learned, finally end with key terms review, summary of learning outcomes, and then various thinking and activities, e.g. ethics activity and critical thinking case, etc. After reading a couple chapters, I can already adopt well into this framework. As an instructor, I can easily draw many great ideas from the textbook to engage students to discuss certain topics further during classes. Even though the textbook seems to be long, it does not take long to read over the material because the topics discussed are very easy to understand and the examples are interesting too. The flow and layout of the text generally make a good sense. It begin with the broader picture of business, and then move to the 4 functions of management. Certainly I can easily divide the topics areas for assignments, quizzes, midterm exams and final exams. Also, I can selectively exclude a few minor areas in the textbook and/or within the same chapter for my classes as some classes may have shorter class time than the others. I can see that this textbook can allow this flexibility. Overall, the topics in the text are presented in a pretty good logical order. The flow is generally very smooth, and I feel that it makes me interested to move on to the next chapter to see what is going to happen next. I think that only a couple areas should be modified. •	Chapter 17 - Career in business should be at the beginning chapter, instead of the last one. I think this may make more sense to get student to learn about different career options/paths when moving long to study the materials. I usually touched on why studying business and what career can lead to during the introduction class. If I really use this text book, I will basically start with Chpater 17 before moving to chapter 1. •	The appendix A regarding the legal and tax environment could have been integrated into the business ethics chapter. It seems to be quite odd to put these topics at the very end of the book under appendix as an optional material. I think these topics are very important indeed. I am only reading the pdf textbook. Everytime when I open it again, I have to manually go back to the page l stopped at. I am sure bookmark function is available somewhere but I did not have it in the pdf viewer I am using. If this is an etext online or through the etext reader, this may solve the problem. It would be much better if I can easily jump from one chapter to another chapter by clicking a menu bar somewhere (just like other e-text I am using). I am pretty sure this is a very common feature for e-textbook. Other than that, overall, I like the charts, diagrams and tables included. They are much better graphical tools compared to the textbook I am using for my course. There are only a few charts that look confusing as indicated in my previous answers. Otherwise, they are very good overall. I do not notice any major grammatical or spelling errors in the textbook. I can only catch a few relatively biased opinions and statements as indicated previously. Overall the language and choices of words are very simple and easy to understand. I can already predict that my students can understand better about the key topics from this textbook rather than the other one I am using. I have to include quite a bit of additional materials to illustrate certain concepts based on the current textbook in my course, but I don't think I need to do so if using this OpenStax textbook. The main issue from this textbook is that this is purely based on the American perspectives, and I can feel that there is some biased towards mainly the American culture and ways of running a business. It is good to see some mentions over workforce diversity in a few chapters in the textbook, but overall the examples used and perspectives discussed are predominantly from U.S. This course introduces students to Canada's economy, different economic systems, business ethics and social responsibility, legal fundamentals and management. The course examines organizational and human resource management concepts and practices, marketing, accounting, finance, and operations management. Ebert, Ronald J., Ricky W. Griffin, Frederick A. Starke, Gearge Dracopoulus. Business Essentials. Eighth Canadian Edition. Toronto, Ontario: Pearson Education, 2017. For certain topic areas, I can foresee to come across minimal issues, e.g. accounting, operation management, business ethics, and marketing. However, topics, like finance, HRM, and career, may be better to focus on the Canadian context. Many of the charts and diagrams offer better clarity than those provided by the current textbook provider. Also, the explanations of the concepts generally make more sense although they are a bit longer than those in the current textbook. However, I do like this one more. So, if this OpenStax textbook can be modified to the Canadian context, I am sure to take it to our department chair to discuss about adopting it in our course instead. However, with this current version, I am just disappointed to say that I am not able to use it with our Introduction to Business course.